New cards that support Hyakki Vogue appear! ACT (VC) 1/Turn GB2: [[Counter Blast] 1 & [Soul Blast] 1 & Choose 1 card from your hand, discard it] Search your Deck for up to 5 “Hyakki” cards, Cal, them to separate (RC), shuffle your Deck, during that turn, each of those Units gais “CONT (RC) GB3: This Unit can attack from the back row”, and when that turn ends, those Units are placed on the bottom of your Deck in any order. CONT (RC)/Deck: This card is also treated as “Covert Demonic Dragon, Hyakki Vogue “Яeverse””. AUTO: [[Soul Blast] 2] When this Unit is placed on (VC), you can pay the cost. If you pay it, search your Deck for up to 1 “Covert Demonic Dragon, Hyakki Vogue “Яeverse””, and [Ride] it at [Stand]. If you Ride it, [Counter Charge] 1. AUTO (RC): [Choose this Unit and 1 of your (RC) “Covert Demonic Dragon, Hyakki Vogue “Яeverse””, place them into the Soul] When your Vanguard attacks, you can pay the cost. If you pay it, search your Deck for up to 1 “Covert Demonic Dragon, Hyakki Vogue “Яeverse””, Call it to (RC), shuffle your Deck, during that turn, it gains Power+5000, and when that turn ends, that Unit is placed on the bottom of the Deck. For Today’s Card we’re introducing from the 10th Booster Pack “剣牙激闘” (on sale February 3rd, 2017): “Hyakki” 《Murakumo》 Units: “Ambush Demon Stealth Dragon, Hyakki Zola Asogi” and “Covert Demonic Dragon, Hyakki Zola”, and “Stealth Dragon, Hitodama Handler”. “Ambush Demon Stealth Dragon, Hyakki Zola Asogi” has a mesmerizing ability that calls up to 5 “Hyakki” cards from your Deck, and during that turn, allows them to call from the Back Row! And if you’ve achieved Generation Break 3, you can call 6 Units, allowing you to pull off a total of 6 consecutive attacks. And, the Called Units return to the Deck when the turn ends, meaning you can activate this ability every turn. Continuing our introductions: “Covert Demonic Dragon, Hyakki Zola”, while on (RC) or in your Deck, is treated as “Covert Demonic Dragon, Hyakki Vogue “Яeverse””. From this, with the call ability of “Covert Demonic Dragon, Hyakki Vogue “Яeverse””, you can call “Hyakki Zola”. And when it’s placed on the Vanguard Circle, by Soul Blasting 2 cards, you can Ride 1 “Covert Demonic Dragon, Hyakki Vogue “Яeverse”” at Stand and Counter Charge 1. You can have it Re-Ride Itself multiple times. By having “Hyakki Zola” Re-Ride “Hyakki Zola” you can keep using Soul. That works in tandem with effects that require Counter Blasts. 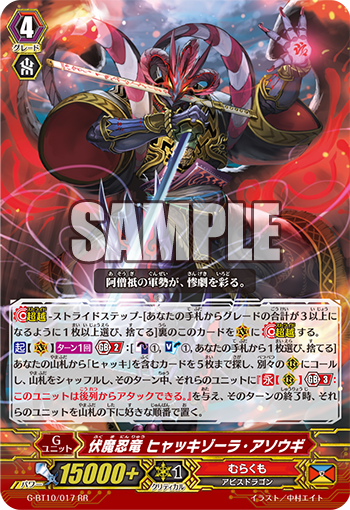 “Stealth Dragon, Hitodama Handler”, when your Vanguard attacks, can place itself and a Rearguard “Covert Demonic Dragon, Hyakki Vogue “Яeverse”” into the Soul, to Call a “Covert Demonic Dragon, Hyakki Vogue “Яeverse”” from the Deck, granting it 5000 Power, but at the cost of returning it to the bottom of the Deck when the turn ends. After attacking with “Covert Demonic Dragon, Hyakki Vogue “Яeverse””, choose it, allowing you to increase your number of chances of attacking. And if you combine it with the previously introduced “Covert Demonic Dragon, Hyakki Zola”, you can activate its ability easily early on since it doesn’t require Generation Break, meaning you can continuously attack before you Stride, which is incredibly powerful. Besides these, “剣牙激闘” contains many cards that further strengthen 《Murakumo》, so look forward to future information.